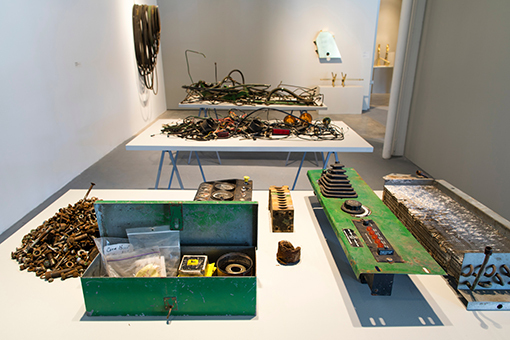 Throughout his practice, David Brooks investigates the tenuous relationship between ecological life and technological industry. 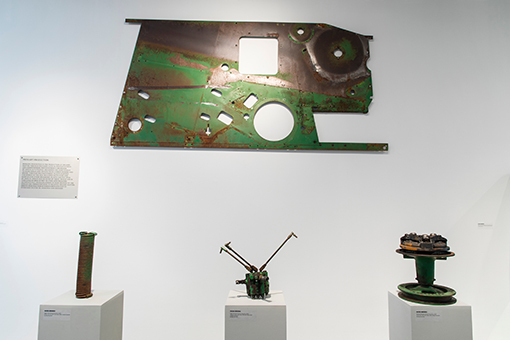 In Continuous Service Altered Daily, Brooks presents every single part of a used 1976 John Deere 3300 combine harvester. 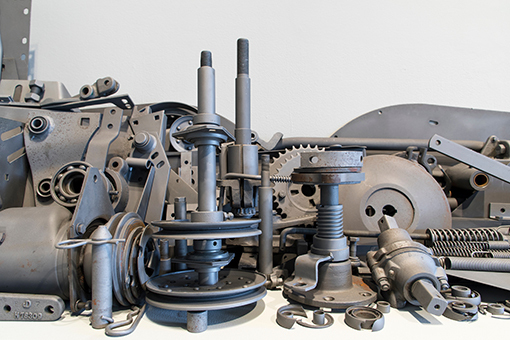 The components are laid out in varying degrees of disassembly. 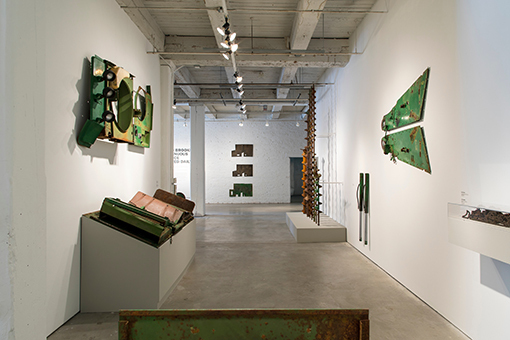 Distinctive elements like the corn head and cab remain unaltered in weathered John Deere green, while other parts are sandblasted, removing rust, paint, and all traces of wear and tear; still others, like gears and fittings, are brass-plated, polished and housed in museum vitrines—akin to the traditional trappings of highbrow art objects or precious natural history displays. 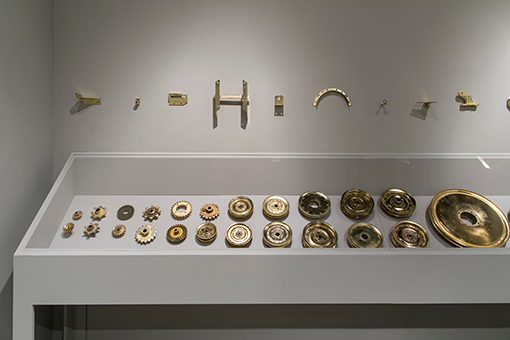 The stunning array of dismantled machine parts, arranged in diverse systems of presentation, are organized according to the ecosystem service that they poetically represent. 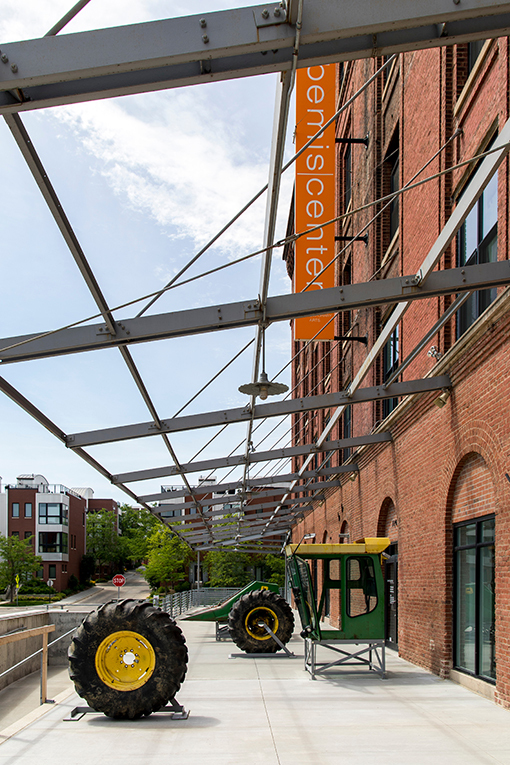 By design Brooks’s imposed taxonomy makes it impossible to conceive of the combine in its entirety or to ascertain the machine’s complete functionality. Similarly, an ecosystem integrates innumerable processes, many of them intangible or undetectable, into one whole. A combine harvester is the ultimate example of agricultural technology, the otherworldly design of its bulky metal body conceals the integration of all stages of the harvesting process into one machine designed to reap grain, a resource that the efficiency of a combine allows us to take for granted as eternally and inexpensively available. Continuous Service Altered Daily asks us to reexamine our perception of products gleaned from the landscape, oftentimes those too easily interpreted as “services” for personal use: water, food, clean air, climate, energy—things we have come to expect to be delivered to us forever. 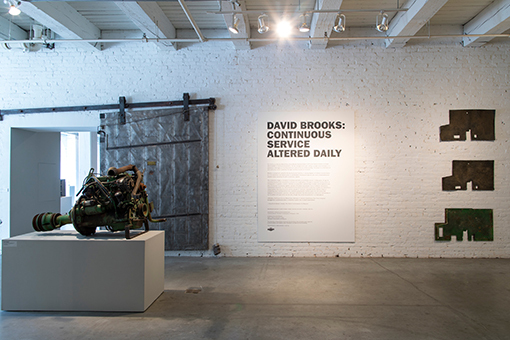 David Brooks: Continuous Service Altered Daily is commissioned by The Aldrich Contemporary Art Museum and curated by Amy Smith-Stewart. 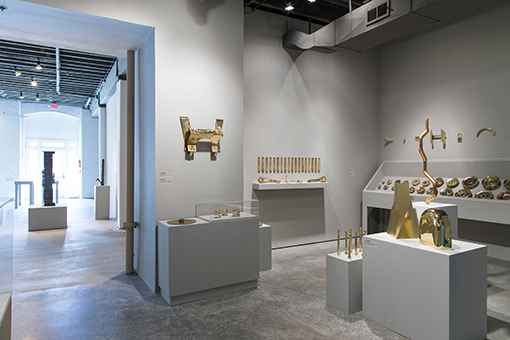 The exhibition was presented at The Aldrich May 2, 2016–February 5, 2017 and was generously supported by the Anna-Maria and Stephen Kellen Foundation and Brad and Sunny Goldberg. David Brooks (b. 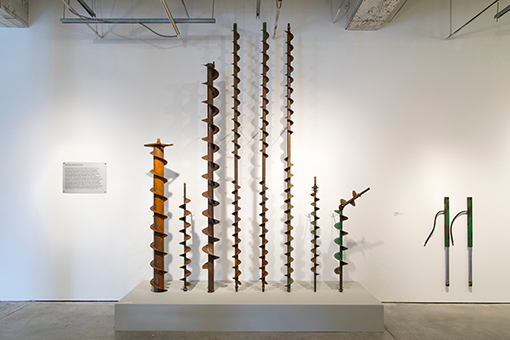 1975, Brazil, IN) received his BFA from The Cooper Union in 2000 and his MFA from Columbia University in 2009. 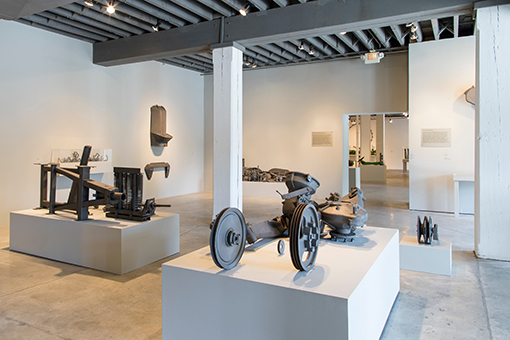 Brooks has exhibited at the Dallas Contemporary; Frances Young Tang Teaching Museum and Art Gallery, Saratoga Springs, NY; Nouveau Musée National de Monaco; Sculpture Center, New York; Miami Art Museum; Changwon Sculpture Biennale, South Korea; Galerie für Landschaftskunst, Germany; the Goethe-Institut, New York; and MoMA/PS1, New York. 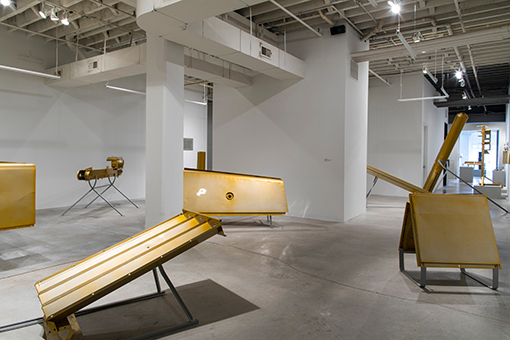 Other major commissions include the Art Production Fund, New York; Socrates Sculpture Park, New York; Storm King Art Center, New Windsor, NY; the Cass Sculpture Foundation, United Kingdom; the deCordova Museum, Lincoln, MA; and the Visual Arts Center, Austin. 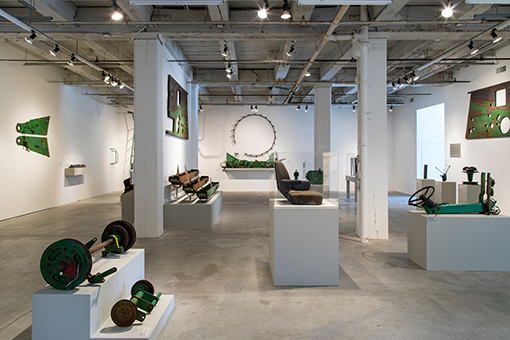 In 2010 he received a grant from the Foundation for Contemporary Arts, in 2012 and 2016 a research grant to the Ecuadorian and Colombian Amazon from the Coypu Foundation, and in 2016, a Smithsonian Artist Research Fellowship (SARF). 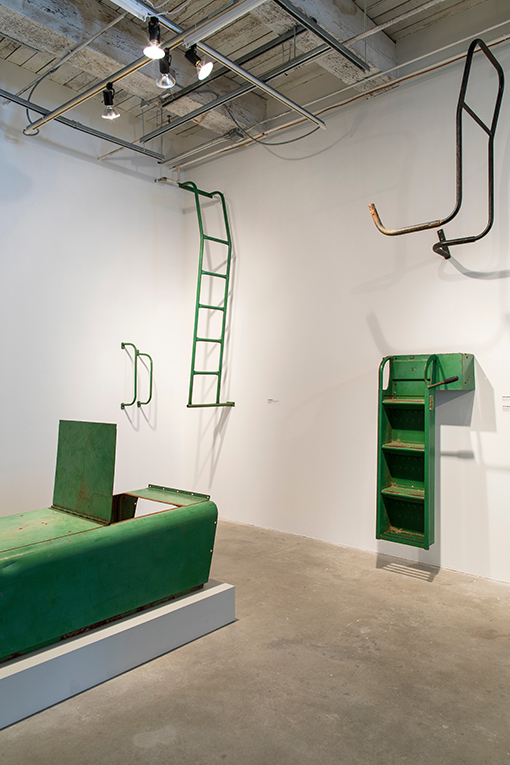 He lives and works in New York City and is currently on the faculty of the Maryland Institute College of Art.